1. Eldest son of the exilarch Ḥasdai; ruled from 730 to 761. In consequence of a dearth of teachers, he found it necessary to install as head of the Academy of Sura a scholar from Pumbedita, though this was contrary to traditional usage. According to Grätz, this scholar was Mar ben Samuel; according to Weiss, Mar Rab Judah ben Rab Naḥman. The fact that Solomon was childless rendered possible the rise to influence of Anan, the founder of the Karaite sect. 2. Another exilarch of the same name, Solomon b. Ḥasdai, flourished in the middle of the twelfth century. He was promoted to the exilarchate by Calif Mohammed al-Muktafi. He did not descend in a direct male line from the Davidic house, but from the Palestinian patriarchs, that is, from Hillel, through the female branch. 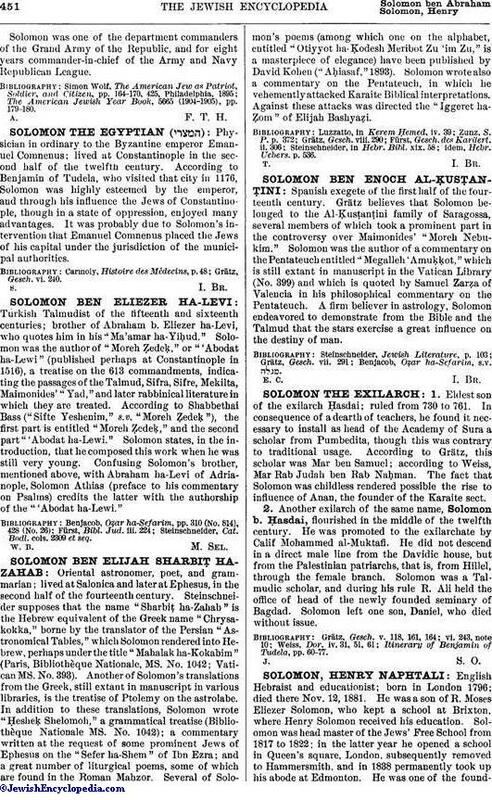 Solomon was a Talmudic scholar, and during his rule R. Ali held the office of head of the newly founded seminary of Bagdad. Solomon left one son, Daniel, who died without issue. Itinerary of Benjamin of Tudela, pp. 60-77.